They say you have to break a few eggs to bake a cake. I've found that you have to break a few more to make gougeres....or at least to get them right. If you follow my twitter feed you saw that I was in NYC last weekend. While visiting friends we had a GREAT restaurant week dinner at Bar Artisanal in the Tribeca neighborhood. My meal was delicious....prawn appetizer, short rib entree, and lemony ricotta desert. 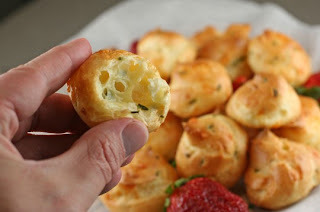 Each restaurant meal also started with a hors d'oeuvres of gougeres. Gougeres are savory little pastries. The base is a dough called a pat a choux. The dough is a base for a lot of french pastries like eclairs or profiteroles. In gougeres, cheese, bacon, or savory herbs can be added to the dough to give it a savory flavor. The gougeres at Bar Artisanal were perfect. They were absolutely delicious. The little puffs of cheese were so delicate and light and came to the table slightly warm, and faintly cheesy. I like to try recipes out at home before I make them for a group or an audience. So I picked a Tuesday night to try and bake them, and if they came out incredible I would simply freeze them, then warm them up in the oven at my friend's house before dinner. Again, I picked the warmest possible day to bake...90 degrees and humid. I cannot be stopped! I knew something seemed weird after I added the first egg. The dough is supposed to absorb the eggs but instead, it became fairly soupy. I kept going anyway...and baked them off...I figured if they had gruyere in them, they couldn't be horrible. They never got as airy and light as the gougeres at the restaurant. And they were sort of greasy. I ate a bunch of them anyway - they did taste like gruyere cheese after all. They were actually very tasty, but they certainly were not true gougeres. They never puffed up like the real thing. I went back to reread the recipe - but I did everything correctly. I'm chalking it up to the humidity in the air. I plan on trying these again before the dinner party. I am determined to get this right! I will keep you updated. Let me know about this post - I thought it would be good to show failures as well as successes in the kitchen - and show how I chose to overcome my kitchen mistakes. How about you? Have you ever had a recipe not come out quite right? What did you make? Did you try the recipe again? I find with pate a choux, it does get soupy as you add the eggs, but you have to keep stirring until the soupiness goes away. I just made some tonight actually... to make potato gnocchi... which were a complete flop! I will try them again, but I'm going to do a little research into what went wrong first. And I would have eaten them anyways too... love gruyere! The first time I tried to make swiss meringue buttercream it was a complete disaster. While I now find that it's one of the best frostings for just about any purpose, it also requires a bit more work than most. I've since mastered it, but that first try was a mess! Something just wans't right with my timing or the temperature of the ingredients or the simmering water (you have to whisk egg whites & sugar over a pot of simmering water) and the buttercream never came together. So, I bought more butter and eggs and started over. If you've ever had swiss meringue buttercream, you know, it was worth it!